Gas House Bight is a minor waterways place minor waterways place place on the waterways major waterways place village town city on the Sheffield and South Yorkshire Navigation (Main Line) between Bramwith Junction (Junction of Sheffield and South Yorkshire Navigations main line with New Junction Canal) (6 miles and 1¾ furlongs and 1 lock to the northeast) and Conisbrough Viaduct (5 miles and 3½ furlongs and 2 locks to the southwest). 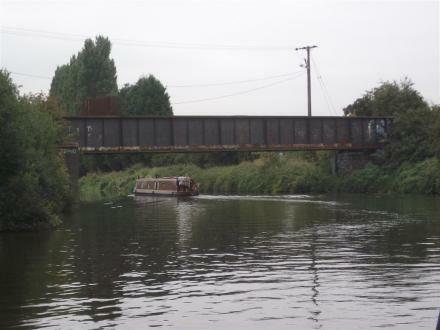 The nearest place in the direction of Bramwith Junction is Wharf Road Pipe Bridge; ¾ furlongs away. The nearest place in the direction of Conisbrough Viaduct is Chappell Drive Bridge No 72; ½ furlongs away. Market Place 37-38, Doncaster, DN1 1 — 719 yards to the south. 38-40 Cleveland Street, Doncaster, DN1 3DZ — 1009 yards to the south. 54 Printing Office Street, Doncaster, DN1 1TR — 953 yards to the south. 46-52 Silver Street, Doncaster, DN1 1HT — 709 yards to the south. Jupiter business park, Doncaster, DN5 9TJ — 1538 yards to the northwest. Frenchgate Shopping Centre, Doncaster, DN1 1SW — 909 yards to the southwest. 8 Silver Street, Doncaster, DN1 1HQ — 829 yards to the south. 30-31 Baxtergate, Doncaster, DN1 1LD — 662 yards to the south. 10 Priory Walk, Doncaster, DN1 1TS — 856 yards to the south. Kontagora, DN2 6 — 1323 yards to the southeast. Doncaster — 244 yards to the south. Market Place, Doncaster, DN1 1NF — 565 yards to the south. The new wool market, Doncaster, DN1 1BN — 504 yards to the south. 19 East Laith Gate, Doncaster, DN1 1JG — 725 yards to the south. 19-20 High Street, Doncaster, DN1 1DW — 791 yards to the south. Priory Walk, Doncaster, DN1 1 — 850 yards to the south. Doncaster, Doncaster — 674 yards to the south. 3-9 Bradford row, Doncaster, DN13NF — 874 yards to the south. 58-59 Hallgate, Doncaster, DN1 3PB — 898 yards to the south. 41 High Street, Doncaster, DN1 1 — 852 yards to the south. Doncaster — 1029 yards to the southwest. Doncaster — 848 yards to the south. 7 Trafford Ct, Doncaster, DN1 1PE — 1004 yards to the southwest. 4 East Laith Gate, Doncaster — 656 yards to the south. 8-10 Scot Lane, Doncaster, DN1 2ES — 791 yards to the south. new bodies, Doncaster, DN1 2TF — 853 yards to the northeast. Kingdom of ink 114 Bentley road, Doncaster — 1324 yards to the northwest. Unit 7 Jupiter Business Park, 353 Bentley Road, Doncaster, DN5 9TJ — 1522 yards to the northwest. Frenchgate Shopping Centre, Doncaster, DN1 1SW — 699 yards to the south. 18 Hall Gate, Doncaster, DN1 3NA — 890 yards to the south. Station Court, Doncaster, DN1 1PE — 1045 yards to the southwest. Trafford Way, Doncaster, DN1 1 — 867 yards to the southwest. 63 Sprotbrough Rd, Doncaster, DN5 8 — 1337 yards to the west. 69 silver street, Doncaster, DN1 1JL — 624 yards to the south. Frenchgate centre, Doncaster, DN1 1QB — 906 yards to the south. Doncaster — 1551 yards to the east. 1 King Street - Off East Laith Gate, Doncaster, DN1 1JD — 780 yards to the south. Frenchgate Shopping Centre, St. Sepulchre Gate, Doncaster, DN1 1SW — 810 yards to the south. Doncaster — 1063 yards to the southwest. Bennetthorpe, Doncaster, Yorkshire, Doncaster, DN2 6AD — 1569 yards to the southeast. High Fishergate, Doncaster, DN1 1QZ — 501 yards to the south. 53-54 Hall Gate, Doncaster, DN1 3PB — 924 yards to the south. Cast, Waterdale, Doncaster, DN1 3BU — 1171 yards to the south. Milton Walk, Doncaster, DN1 3SS — 1490 yards to the south. Wheatley Hall Road, Doncaster, DN24 — 1447 yards to the northeast. Doncaster — 1297 yards to the south. 171 York Rd, Doncaster, Doncaster, DN5 8XG — 1090 yards to the west. Frenchgate Shopping Centre, St Sepulchre Gate, Doncaster, DN1 1SW — 842 yards to the south. St Sepulchre Gate, Doncaster, DN1 1SW — 805 yards to the south. 630 yards to the south.